(2-29-16) What’s the key to helping someone with a mental illness recover? Is it robust community mental health services? Is it by forcing someone to take anti-psychotic medication? Is it housing? Jobs? I’ve spent the past ten years traveling our country touring programs, examining services and talking to mental health experts, other parents, family members, and persons who have recovered. And I’ve come to believe that everything we do to help people recover is a temporary band-aid if the individual who is sick doesn’t want to get involved in their own recovery. This doesn’t mean that I’m no longer going to speak about the inappropriate incarceration of persons with mental illnesses in our jails and prisons. I still plan to talk about the need for Crisis Intervention Team training, jail diversion, mental health courts, and re-entry programs. 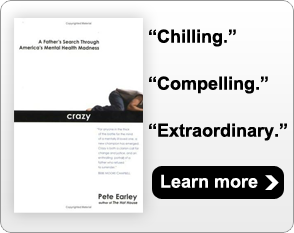 I’m still going to speak about my book, CRAZY: A Father’s Search Through America’s Mental Health Madness, and how my son’s breakdown and arrest led to me spending ten months inside the Miami Dade County jail following persons with mental illness through the criminal justice system and back onto the streets. I plan to continue my campaign to get persons who have mental illnesses out of jails and into treatment. But I’ve written my new speech because I want to share lessons that I’ve learned — often painfully — dealing with my son, Kevin, and his mental illness. I’ve written my new speech because the hundreds of persons in recovery who I’ve met have each told me the same story. The day their recovery began was the day that they acknowledged they were sick and decided to take steps to get better. This insight was bitter sweet for me because for many years after my son’s first episode, he didn’t believe anything was wrong with him. I argued with him. I offered to pay him to take his medication. I counted his pills and threw him out of my house when he didn’t take them. I tried tough love. I tried everything that I could think of to help him. And eventually he got it. But first there were five hospitalizations, an arrest, being shot with a Taser by the police and difficult times in our father/son relationship. Please don’t misunderstand what I am writing. I know that many of you are suffering. I know you are frustrated because you have tried everything to get someone you love help and they have been resistant. Remember, Kevin was involuntarily committed four of the five times that he was hospitalized. I understand what it is like to be alienated from a child. This is why I want to share some of what I have learned and what I eventually have come to believe. Kevin and I were stuck on a hurtful cycle of community services that didn’t work and hospitalizations that didn’t work until he finally accepted that he was sick and he decided that he wanted to become better. And there are steps we should be taking as a society to engage people early on to break those cycles. I found that to be true. I am not a psychiatrist or academic offering a magical cure. There is no secret solution because everyone’s story is different. I am simply a father who wants to help others by telling my family’s story. In my new speech, I use my experiences trying to get Kevin help to expose weaknesses in our current mental health system. There were many times when Kevin could have been engaged, but wasn’t. For instance, I’ve discovered that many times persons are willing to seek help when they first become ill. This is perhaps the most important time to get someone help because the earlier that help is offered, the better the outcome. But the dismal and hopeless future that came along with his first diagnosis was so bleak that neither of us wanted to accept it. We were told that Kevin would never get better, would probably never be able to work, would never marry, and would die twenty five years before his peers. We were told that it would have been better for him to be a drug addict than to have a mental illness. That grim news sent both of us into denial. This couldn’t be happening to my son! This couldn’t be happening to me! That was the first of many missed opportunities. After examining missed opportunities, I talk in my new speech about the personal lessons that I have learned as a parent in dealing with an adult child with a serious mental illness. Because mental illnesses are cruel diseases, again there is no one-size-fits-all solution. I realize it’s unpopular to say this, but there may be individuals who are so sick, they may never have the insightful moment that it takes for them to become engaged. But I think there are many ways that we can try to help even the sickest get help. We must have hope and we must have a mental health system that tries to engage individuals by meeting them where they are in their illness and a system that gives them hope for a brighter future. I’m so excited about this new speech that I am cutting my normal speaking fee in half for any group that has invited me during the past ten years to speak at one of its functions. So if you’ve heard my speech about our “crazy” system and the need to reform it, and you want to hear what I have to say about engagement being the key to recovery, then contact me.